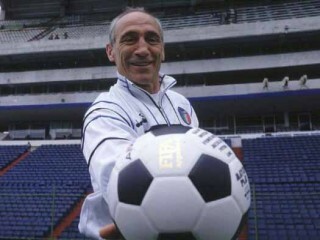 Enzo Bearzot is a former Italian football player and manager. He is mostly renowned for having led the Italy national football team to a triumph in the 1982 FIFA World Cup. After having ended his playing career in 1964, Bearzot became assistant coach of Torino, working with Nereo Rocco and Giovan Battista Fabbri, then debutting as head coach for Prato of Serie C. However, Bearzot did not go on a club career, and instead started working for the Italian Football Federation, first as under-23 head coach, then as assistant coach of Ferruccio Valcareggi in the 1974 FIFA World Cup. After the German World Cup, Bearzot was appointed as vice-coach of Fulvio Bernardini, and was then promoted as head coach of Italy in 1977. It was Bearzot who drove the national team to a good fourth place in the 1978 FIFA World Cup, obtained thanks to one of the most exciting playing styles in the competition. Bearzot repeated himself in the Euro 1980, hosted by Italy. In the 1982 FIFA World Cup, after three poor draws in the three first matches, Bearzot announced the so-called silenzio stampa (press silence) in order to avoid the raising critics from the Italian press. Following that, the Italian team finally started to play its best football, defeating teams such as Argentina, Brazil in the second round, and winning the semi-final to Poland. In the end, Bearzot won even the final match against Germany, leading his team to the first World Cup since 1938. One of the widely remembered pictures of that adventure is probably the game which saw Enzo Bearzot playing scopone with Dino Zoff, Franco Causio and the Italian President Sandro Pertini. Italy and Bearzot did not qualify for the Euro 1984. Bearzot resigned after the 1986 FIFA World Cup, which saw Italy being defeated in the round of 16 against France. After a long period of inactivity, Bearzot was appointed President of the FIGC Technical Sector (Settore Tecnico, the main football coaching organization of Italy) in 2002. He left this office in 2005. View the full website biography of Enzo Bearzot.